A chemical burn can occur when a worker’s skin or eyes come into contact with an irritant, for example an acid or base. Also known as caustic burns, they can affect internal organs should any chemical also be digested. Chemical burns can be caused by products such car battery acid, bleach, ammonia, solvents, paper thinners, pesticides etc… The symptoms can vary depending on the chemical in questions and the length of time workers were exposed. 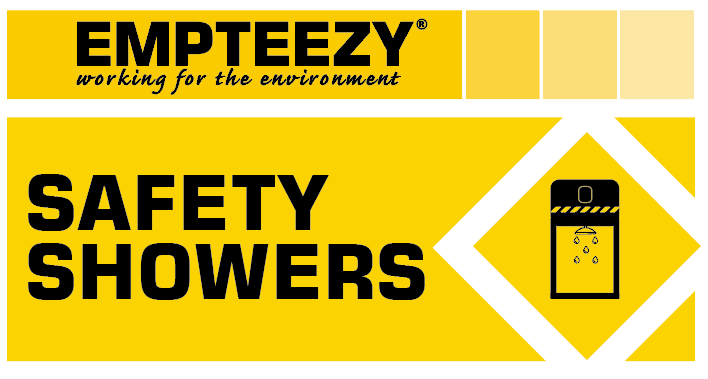 At Empteezy, we provide a range of decontamination solutions to ensure the safe and compliant way to aid workers in the event of an incident. Below we provide guidelines on what to do when a worker experiences a chemical burn on their face. The most important thing is to identify what chemical has been involved in any incident. Some chemicals can react adversely to water, so be sure to check the Material Safety Sheet, or ensure you contact a first aid professional as a matter of urgency. When the worker came into contact with the hazardous substance, did any go into their mouth? If so, they should immediately check for cuts or burns , or advise if any has been swallowed and phone 999 immediately. As carefully as possible, try to remove the chemical and contaminated clothes or accessories but be sure not to spread the chemical further. Use PPE for protection and be sure the worker does not wipe their skin as it may spread contamination. Rinse the affected area with clean water as quickly as possible. Should the worker have access to a mounted eyewash system, they should be able to self-activate and rinse their face and/or eyes. Alternatively, a portable eye wash system will provide the relief required should the worker be in a remote location. Tepid water should be continuously doused on the affected area for at least 15 minutes, and 20 minutes for the eyes, prior to seeking emergency help. With the consequences being life changing, the prevention of chemical burns in the workplace is imperative. Be sure to store and handle chemicals correctly and safely. Use chemicals in a well ventilated area and leave them in original containers with their labels for easy identification. Ensure workers always wear the correct level of PPE when dealing with dangerous substances. You are responsible for the safety of your staff. Material Safety Sheets, emergency response plans and compliant handling of liquids will help minimise risk. At Empteezy, we offer free site assessments to help guide you on the best products for your business. Get in touch today to find out more. This entry was posted in General, Portable Tanks. Bookmark the permalink.